It is April 14, 1912. You have accompanied the good Dr. Lucky on the maiden voyage of the Titanic. As the ship is sinking, you must frantically save the old man, but he firmly believes his good luck will save him, and he rebuffs your attempts to help as he continues to meander through the passageways of the doomed liner. 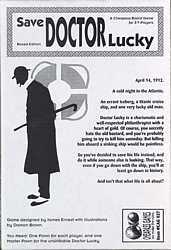 Someday, you will kill him for his stubbornness, but tonight, you must Save Doctor Lucky. In this clever twist on the original Kill Doctor Lucky, players move around a sinking ocean liner trying to collect items that help to save the good old Doctor Lucky. It wouldn't be too hard, except all the other players are trying to stop you by playing failure cards.